Discussion in 'Lights - Store Bought and Home Made' started by bovonic, Jan 4, 2013. Before I found this forum I designed and made a light for my Christmas display. I'm sharing my experiences here in case it's of interest to someone. I used a product called EL wire (a.k.a Electroluminescent wire). You can read the wikipedia page to find out all about it but essentially it's a phosphor coated wire which when high frequency, low current electricity is passed through it it glows. The wire radiates light in 360 degrees and is flexible making it a good candidate for clothing / wire frames etc. By wrapping the wire a in coloured sleeve, you get different coloured lit wire to play with. In bulk it retails for around $3.50-$4 a metre, otherwise it's about $14.50 for a 3m length and a good variety of colours are available. In case anyone else makes an EL-wire design in future, I used the copper tape method of connection. In future I'd solder them to a conductive ferrule instead as the tape kept coming unstuck (I suspect I had cheap adhesive copper tape). Through ebay I bought several lengths in various colours (5mm) and had grand plans to make up multiple custom designs. I suspect that it was that I bought a cheap rip-off product rather than the name brand that made it such a pain to work with (combined with less than ideal wire strippers), but regardless, the stupid number of hours I spent working on something that shouldn't have taken anywhere near as long deterred me from making any ones past my first. Particularly, the EL-wire features two "angel hair" wires that look about half human hair thickness that need to be soldered at every connection, and I became an expert in usually breaking them during wire stripping (my biggest problem with it), or when I managed not to, overheating them and melting/breaking them off. My soldering skills are rudimentary and I was trying to use lead-free solder which didn't help, but the product was painful to use. Plenty of other people on the web use it though and don't whinge about it like I just did, so it probably pays to buy the brand name stuff. So anyway, in short I found some coro at Bunnings and decided to use it for its ease of use to work with over wood. I designed a star by dividing a circle, drilled holes through the coro and poked the wire through to make the design. Small cable ties were placed regularly to hold the design in place as hot glue I was using kept coming unstuck (though from the coro, the wire or both I cant remember). To avoid using too much EL wire I soldered in short joining wires on the back between the lit pieces making the design. In hindsight (due to the pain of working with the stuff) I should've kept the joins only to where I wanted to change colour rather than trying to save wire, but you live and learn. So here's the photos post construction. The lit version doesn't show up the real colour difference between the white and blue segments so I've included a pic of my house from a previous year where the colours can be better seen. I hope this is useful to someone at some point. EL was all the rage for a while, especially for tacky t-shirts....but now finally a good use! EL has such a diffuse soft light, it looks quite like nothing else. Looking on ebay there are cheap 5V and 12V drivers as well, although I doubt intensity is proportional to voltage, on is still on and off is still off. Apart from the headaches, implementation should be straight forward into existing controllers. Now what other effects can we conjure up with this?? I'm just happy to be able to contribute something to the community for all the questions I'm asking everyone else!!! Thats what makes this site so great. Sharing ideas. Some may have already known about EL wire while others will learn from this thread. The questions you ask may set of a lightbulb on something new. Never can tell what results will come from questions and/or sharing. Thought I might bring this idea back to life. I am thinking about using this to light up a costume for an camping event. Would look really awesome. Ebay has the right brand of Electroluminescent wire im looking for. What was on Americas got talent. 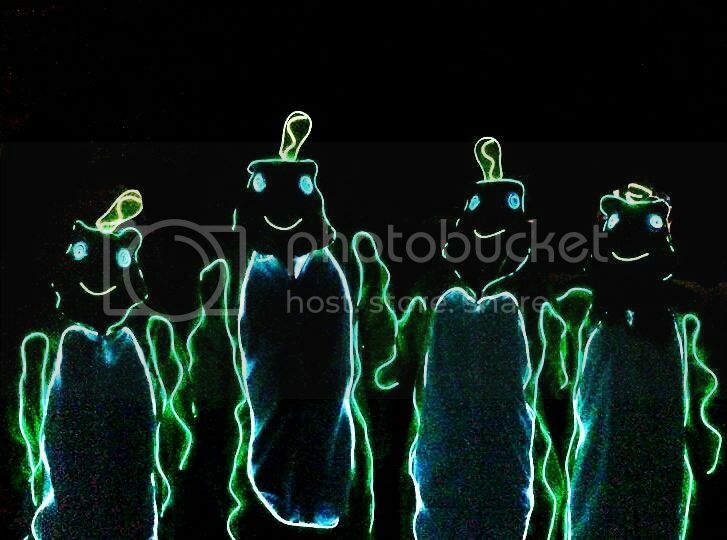 Glowcity.com Crazy Frog dance"stick figure costume" "best costume"
Should be a lot of fun with plenty of laughs. Has anyone else tried this and what are your thoughts? One more thing. These lights can be sequenced. Here is a controller. But not for me this year. Is this flexible enough to be made into a flag? I attended an indoor rodeo a few years ago, where the colors were presented on horseback. Part way thru, the lights were dimmed and the flags glowed. The material was flexible enough that it still flapped in the wind and they rode by at full gallop. Sorry for the late reply Brian. I've only used the 5mm and I wouldn't consider it flexible enough for a flag. The 2mm on the other hand I understand is rather flexible as it's often used in clothing. I'm not sure whether you'd get the same amount of flapping as you would without the EL-wire sewn on (again as I haven't used 2mm) but you'd certainly get some waving in the wind - I'd expect it would be enough for what you want. Below is a picture of our costumes. The el wire was sown unto frog onezies. Looked great. Very nice. That must have been cool looking.